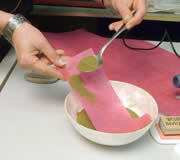 You will need: Mulberry Silk Paper, Rubber Stamp, Embossing Pad, Embossing Powder, a wide container, spoon, small paintbrush, water, cotton wool and glue stick. 1. 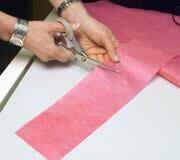 Cut up your mulberry paper into small, managable sheets. 2. 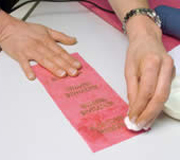 Gently tap rubber surface of stamp onto embossing ink pad to wet surface. 3. 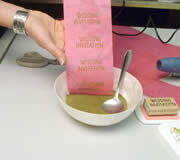 Press wet stamp evenly and firmly onto Mulberry Silk Paper. 4. 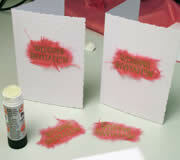 Cover with embossing powder. 5. Gently tap off excess powder back into container. 6. Apply heat gun to embossed image until just melted. Do not overheat. 7. Using a damp cotton wool ball, gently wet around each embossed image. 8. 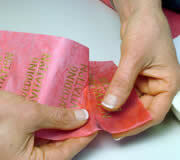 Gently pull away paper from around embossed image to give a soft, feathery edge. 9. Wait until dry, then glue on the back. 10. Stick on to your card in the desired position.